I have been a colon hydrotherapist (also known as colonic irrigation) for 19 years. Most healthcare professionals believe that 90% of disease originates in the colon. Colon Hydrotherapy is very important detox program to rid the body of accumulated metabolic waste. As you know in our fast-paced and stressful lifestyle, consumption of structurally altered food and exposure to all sorts of toxins in our environment leads to a scientifically proven condition of internal toxicity. Colon Hydrotherapy or colonic irrigation is a way of removing cattarrhal plaque build-up from the large intestine. It also has a detox effect on the liver thereby assisting in the removal of acid build-up in the body.Colonic irrigation has many health benefits such as improving the symptoms related to colon issues eg. IBS, spastic colon, diverticulitis, skin problems etc as well as boosting the immune system. It also has an anti-ageing effect by ridding the body of its toxic load. With the use of natural herbal remedies and Colon Hydrotherapy treatments you can dramatically reduce your internal toxicity. I have been practicing BodyTalk since 2005 and am qualified in all the modules as required by the International BodyTalk Association. BodyTalk is a simple and effective holistic therapy that allows your body’s energy systems to be re-synchronized so they can operate as nature intended. It is extremely effective in addressing emotional issues caused by trauma and stress. As WholeHealthcare™, BodyTalk understands the profound influence the psychology of the body has on our health. Instead of focusing on the symptom, BodyTalk finds the underlying causes of illness by addressing the whole-person and their whole-story. The BodyTalk techniques provide insights to the areas of your body that need attention. What might seem like an obvious problem to you is not necessarily the one your body wants to address first. For example, if you say “I’m never doing that again!¨ that decision stops the energy and limits what you can receive. Does a decision like that create more choice in your life or less? Would it create an impact on your body? Fortunately, this can be changed easily and quickly. 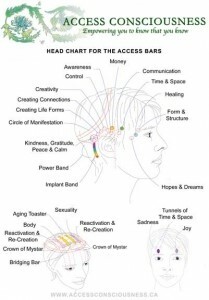 By running energy through these bars, the barriers dissipate and the electromagnetic charge is released. Releasing stuck energy is like deleting old files off your computer. You have more space to create something new and wonderful with more up-to-date tools! Running The Bars™ is a simple, non–invasive, energy process where the facilitator lightly touches each point on the head to release the energy. Receiving this process (having your Bars run) usually leaves you with a sense of peace and space; and a feeling like there is more possibility open to you. This is an incredibly dynamic process that will not only leave you feeling refreshed and relaxed as if you have had a deep restful sleep, it can also change your life. When run on children before exams, it can have a dramatic effect on their grades. Pregnant women report that labour is much shorter and the birthing process is much easier when they have their bars run regularly. Many people report that it assists them in sleeping more soundly. What else is possible? For any further information, please do not hesitate to contact Valeta on +27824968910.